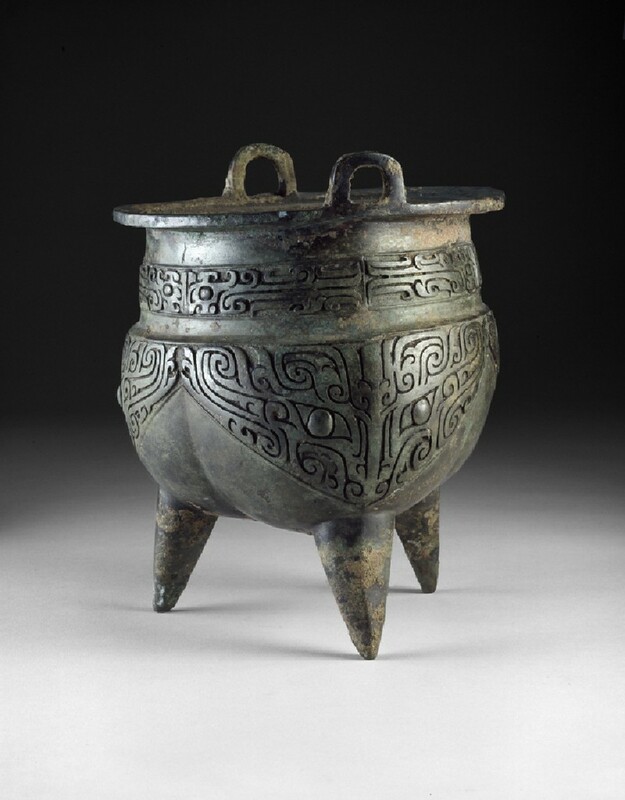 Bronze ritual vessels were probably first manufactured in China during the early part of the Shang Dynasty (1600 BC–1050 BC), and this continued, with various changes in shapes and decoration until the end of the Eastern Zhou period in the third century BC. The earliest bronzes were decorated with narrow horizontal bands, with swirling ornamental lines centred on a pair of prominent eyes. These abstract patterns were developed during the Shang Dynasty and Western Zhou period (1050BC-771BC) to become more complex animal-like designs. The eyes provide a focus around which a more or less easily recognisable animal face gradually forms. This symmetrical mask, known as a taotie, and a related mythical beast called a kuei dragon are the predominant decorative themes on Shang bronzes. This li-ding depicts an almost fully-formed taotie, repeated once above each of the three legs. The eyes are clearly outlined and two C-shaped horns, a snout and an upper jaw can be distinguished among the decorative curls. The highly stylised body of the animal extends to either side of the eyes and ends in a curled tail. This taotie, like many other examples from this period, may also be interpreted as two confronted kuei dragons, joined at a central, vertical line. The combination of two kuei reappears in the band around the top of the vessel, although here the various elements of the face and body are less clearly defined. Stylized monster mask decoration with prominent eyes and scrolling horns. 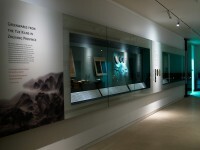 The motif has been known since the 1100s. Its significance remains mysterious.